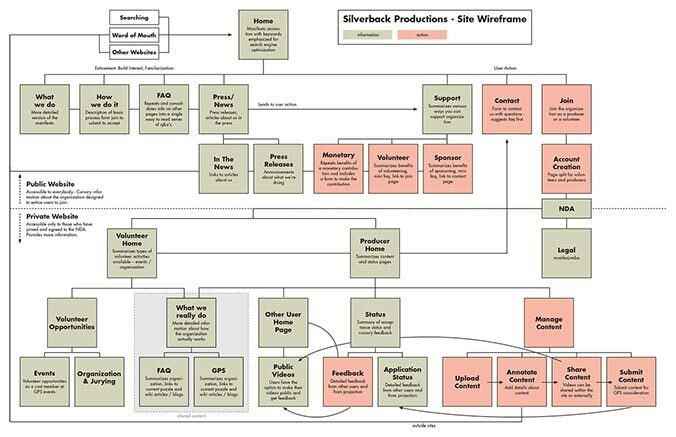 Silverback Productions was a semester long group project in which we developed an organization to promote and distribute underground and independent cinema. I worked with William Calloway and Kelley McClure on the project. 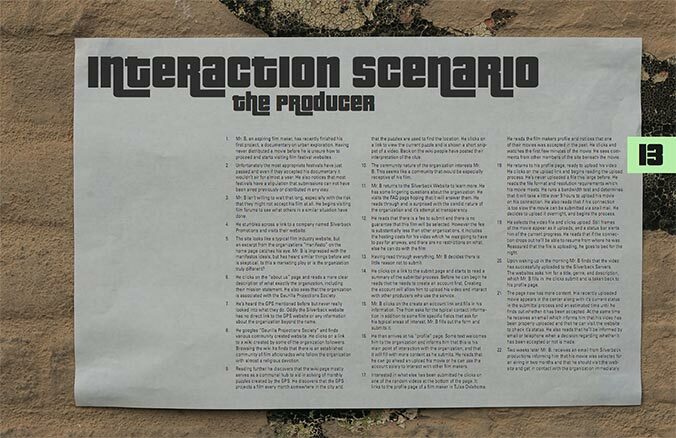 My role in the group was as the interaction designer. We developed two related organizations: Silverback Productions, which curated film submissions through an online community, and the Guerilla Projectionist Society (GPS), which promoted those submissions by projecting them throughout downtown. My primary contributions to the project were the Silverback website and the GPS wayfinding app. It was decided early on to split our organization into two sections. 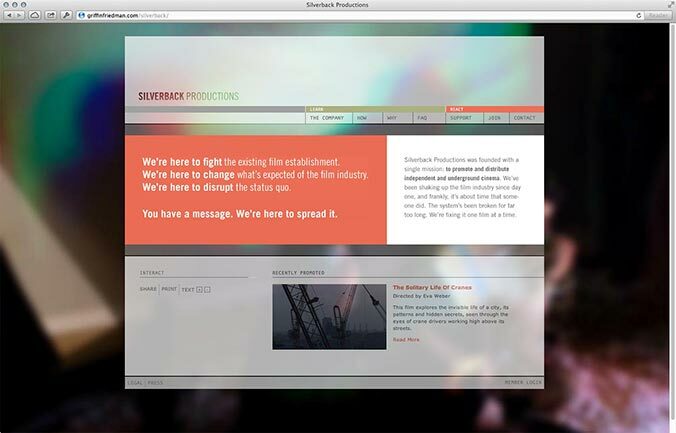 Silverback Productions became the content curation side of our organization while the Guerilla Projectionist Society (GPS) would handle the promotion and distribution of content. The two organizations would be linked administratively, but this link would not necessarily be clear to outsiders. 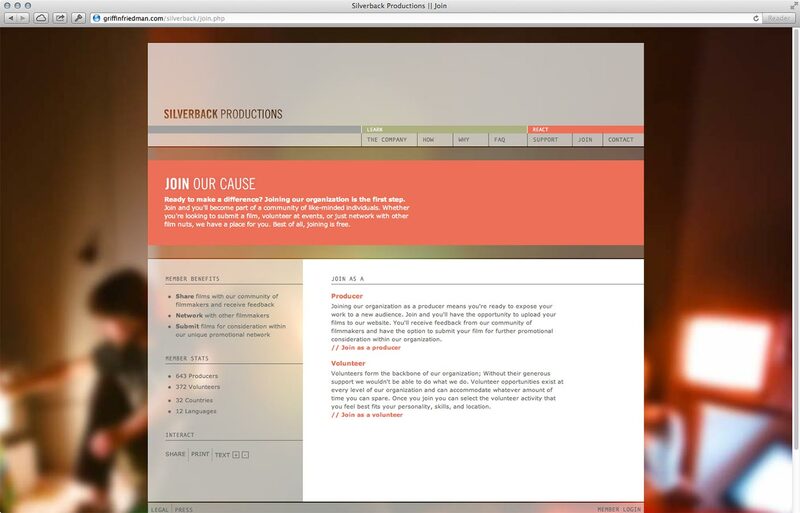 This separation allowed us to create a design language for Silverback Productions that was unique from the GPS and catered better to the content curation goals. Before designing the website, extensive research was performed to see how similar organizations (film festivals, independent distributers, etc.) handled their web presence. The general site layout typical in the industry was noted, along with the general style of language. The design language of our website would reference these industry standards to provide reassurance and familiarity, while also deviating from the standard to support our mission of challenging the status quo. 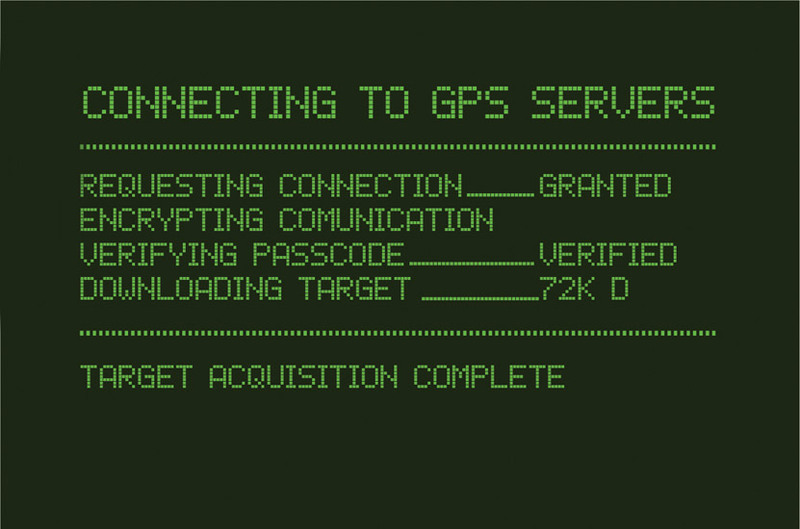 While the design language was completely independent from the GPS, subtle links were added, including the color scheme and the background images, to bring the two designs together slightly. This link would not be readily obvious, but once in the know, it would be apparent. For the design of independent pages, a simple and clear layout was chosen with a navigation bar, main content area, and an auxiliary content area that would annotate the main content. 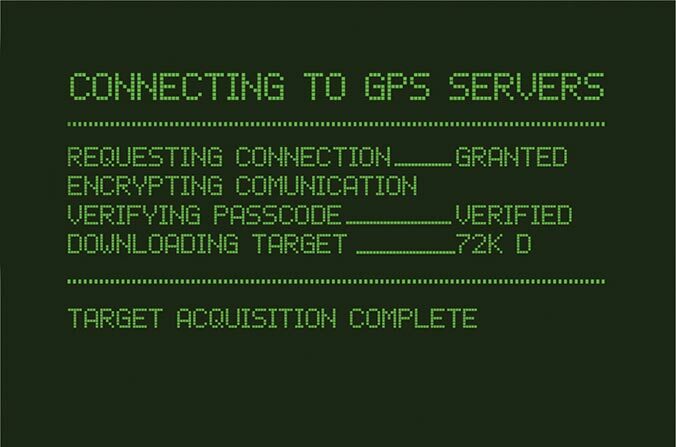 The only imagery present on the page was a simple blurred background photograph of an actual GPS event. The content was thus “projected” on top of the background. Because of the lack of imagery, text took an a more important role, and a special focus was used on the tone of the language and the order in which it was presented. 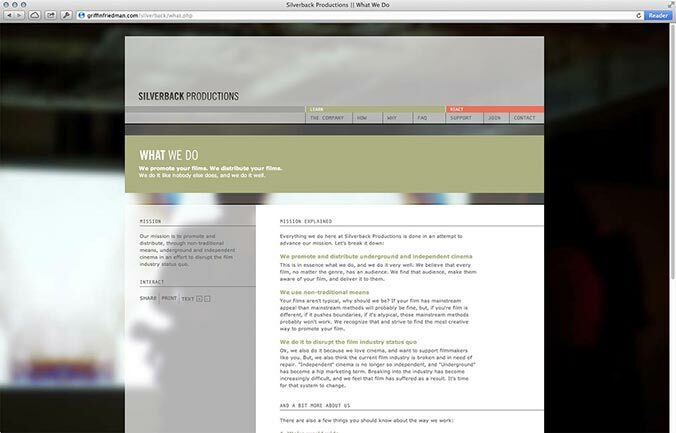 The Silverback Productions homepage. Content is divided into two sections: "Learn" and "React." Visitors progress through the pages with the eventual goal of joining the organization. Careful attention was placed on creating friendly and motivational language. Visitors progress through the pages with the eventual goal of joining the organization. After joining, visitors receive more information about how the organization operates. ￼ With this iPhone application, Guerrilla Projections Society viewers become “mission operatives,” downloading “targets” (the location of the next Guerrilla Projectionist Society projection), navigating to them with he aid of augmented reality, and finally, spreading the application to friends, and, in the process, virally marketing the Guerrilla Projections Society. 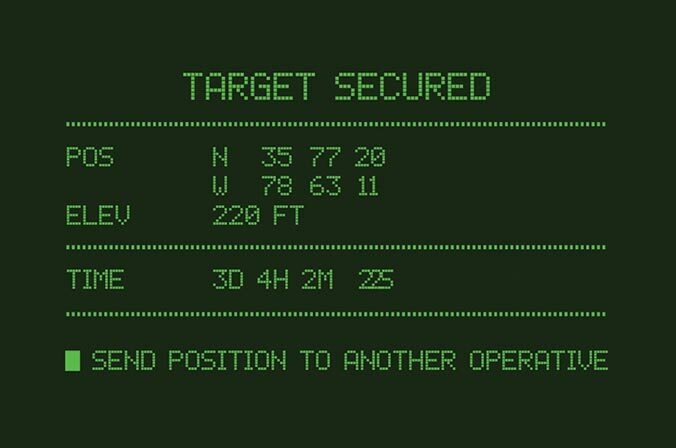 Additionally, the app features a countdown until the next event, adding a sense of urgency and excitement to the hunt for the location. Usage scenario for Wayfinding Application. With this iPhone application, Guerrilla Projectionist Society viewers become “mission operatives,” downloading “targets” (the location of the next Guerrilla Projectionist Society projection), navigating to them with the aid of augmented reality, and finally, spreading the application to friends, and, in the process, virally marketing the Guerrilla Projectionist Society. 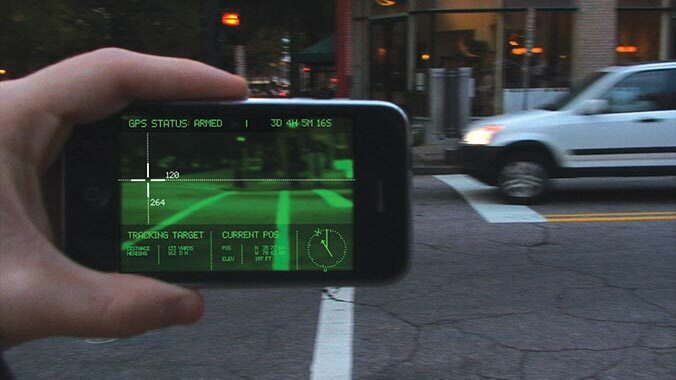 This application uses the built-in GPS and compass to determine the position of the next event. 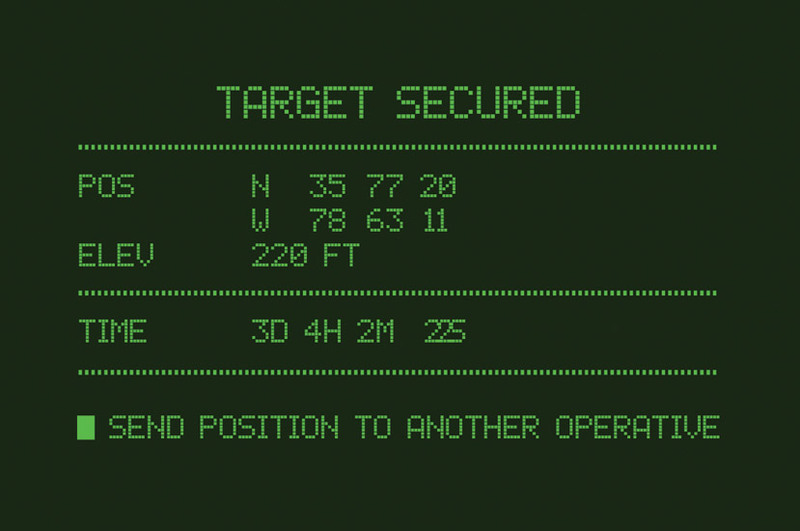 While the GPS obtains the current location in the background, the application visibly "downloads" the next mission, adding to the pseudo-military feel. The position of the next event is then overlayed in real time on a live video feed from the iPhone’s camera. The video feed is filtered to give it a night vision look. Once a user locates the projection site, they have the opportunity to send the site to others, virally advertising the organization.